As the winner of the IF award for 2014, the hand-carried system, the SonoScape S9 remains a widely used ultrasound system packed with countless useful features. The S9 portable ultrasound is one of the first shared service systems with a full touchscreen interface (separated from the display screen) that includes all of the major imaging controls. Furthermore, this interface is incredibly easy to use, it’s intuitive, and it allows for quick and efficient action. The SonoScape S9 ultrasound boosts the resulting image quality through features such as speckle reduction and compound imaging, as well as advanced options such as Stress Echo, Panoramic Elastography, and 4D OB/GYN. While taking images, operators can take advantage of the ultrasound’s 15-inch LCD monitor and 45-degree tilting capability. On the back of the ultrasound, operators can find two probe ports, allowing quick and easy probe changes. 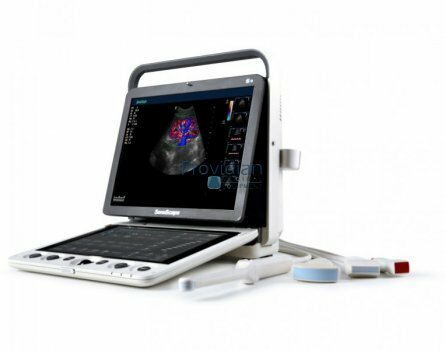 We found the SonoScape S9 to be a very impressive ultrasound machine with excellent image quality. Its touchscreen user interface is very user-friendly, efficient, and well-designed. We tested the S9 side-by-side with large console ultrasounds and some of the top portable ultrasound machines on the market… we found that the image quality is comparable or better than some of the best portable ultrasound machines for sale. To say we are impressed with the SonoScape S9 portable ultrasound unit would be an understatement. This is is a great machine.